A team of ornithologists were working on a small Moroccan island when they observed some rather bizarre behavior in adult falcons. The raptors appeared to be imprisoning tiny birds in the crevasses of rocks in an effort to keep them fresh for a later meal. 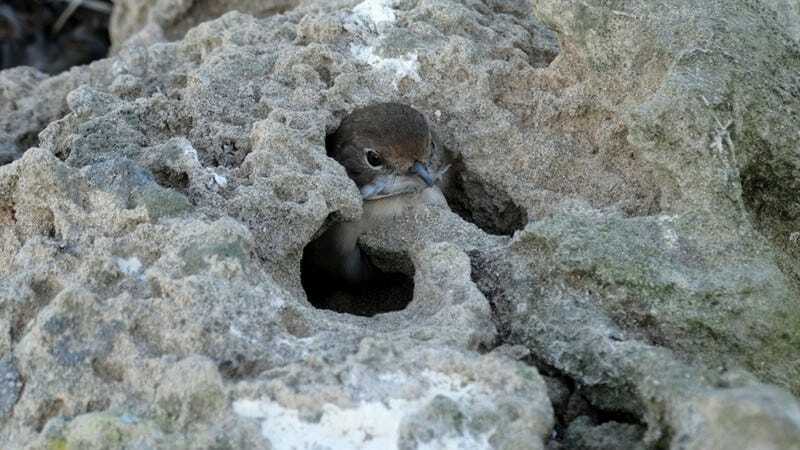 As reported in New Scientist, University of Rabat ornithologist Abdeljebbar Qninba was doing field work on the barren Moroccan island of Mogador in 2014 when he noticed a number of small birds stuck in deep cavities. On closer inspection, he noticed that the helpless birds had their flight and tail feathers removed. They couldn’t move their wings or use their dangling legs. The birds appeared terrified, and sought any opportunity to escape. In Qninba’s ensuing report, which can be found at the science journal Alauda, he theorizes that — in what is an apparent example of nonhuman animal husbandry — the falcons were deliberately storing the birds as a means of maintaining live, fresh prey. This behavior may allow falcon parents to stay near their nest, and still have a meal close by to nourish their offspring. It’s also possible that the falcons are giving their young chicks an opportunity to kill their own prey. More observations are needed, but it appears that the falcons are storing their prey for at least a day or two. Qninba says that the birds were trapped before the falcons’ eggs had hatched, and that local fisherman have known about the practice for decades. Rob Simmons of the University of Cape Town in South Africa is skeptical. “I don’t believe a falcon has the cognitive ability to ‘store’ prey like this,” he says. “I think the birds’ prey may simply be escaping and finding refuge.” Raptors often start plucking their prey before they kill them, so the injured birds may simply be escapees. Other species have been observed to engage in this type of behavior, including shikes who impale their living prey on thorns or barbed wire, and shrews who use their venom to paralyze mice, which are then devoured slowly.